Although Quorn Village On-line Museum doesn’t own many artefacts in its own right, we do come across some incredibly interesting items, which people allow us to photograph and which we can then try to investigate. Sometimes stories emerge that provide a fascinating glimpse into the lives of our forebears in Victorian Quorn. 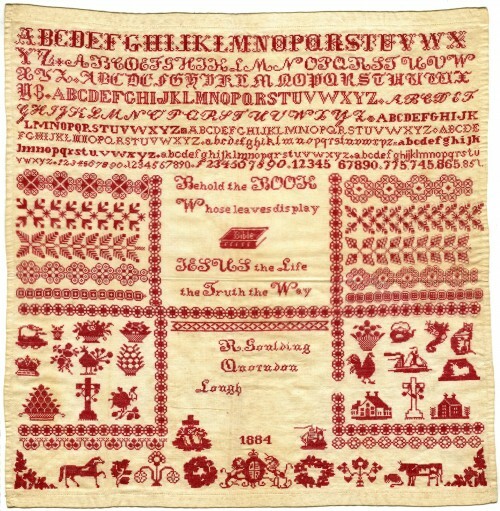 Recently an intricate sampler came to light. 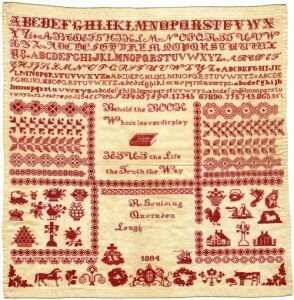 It is minutely stitched in red thread and says ‘R Goulding, Quorndon, Lough.’ After the application of a few skills that Sherlock Holmes might be proud of, a story was revealed that involved the fortunes of four orphaned children and a scandal involving the headmaster of Quorn Primary School! It even brought to light a long forgotten murder.